It is a simple add-on to automatically create an Alchemist's Daily Writs. I am not good at translating texts. Would not you tell me if there are more user-friendly translations? Fixed a bug that keeps creating the same item. 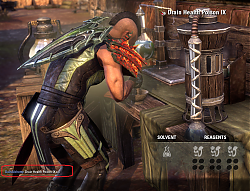 Crafting interface closing when no active writ. Some users have string.lower() disabled? Fixed recieving items from bank automatically. Fixed sorting method by price. Modified a bit of material acquisition method. Fixed a little bit of processing to remove material from the box. Fixed creating the wrong item when Master Writ. Fixed a bug that caused errors when crafting with multiple characters. 1.Started to support [FCO Item Saver]. Add keywords for item acquisition. I am grateful for KiriX cooperation. Too many call the server within a short time inside the add-on. 1. Started to support Home Storage. Fixed a problem that can not get item from bank. Version: 0.9.7 bug fix was added. 1.Add automatic exit function from craft station. Corresponding to unsupported recipe name, there was a leak, so modify keywords. 1.Partial code correction for testing. A strange code(0xC2) is inserted instead of a space(0x20). 1. Bulk Creation function added. 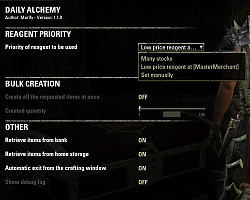 Is it compatible with the other Alchemy add-ons? Also would be nice to have an option to craft in bulks. Like 5-10-15 etc. [Compatibility with other Alchemy add-ons] means cooperation or simultaneous use? We do not cooperate, but there is no problem even if you use it at the same time. I also use Dolgubon's Lazy Writ Crafter and Potion Maker at the same time. This add-on repeats automatic creation until it reaches the required number of daily craft. In other words, you can only create a daily craft. Good news it's compatible with them. Bad news it can't craft multiple times. 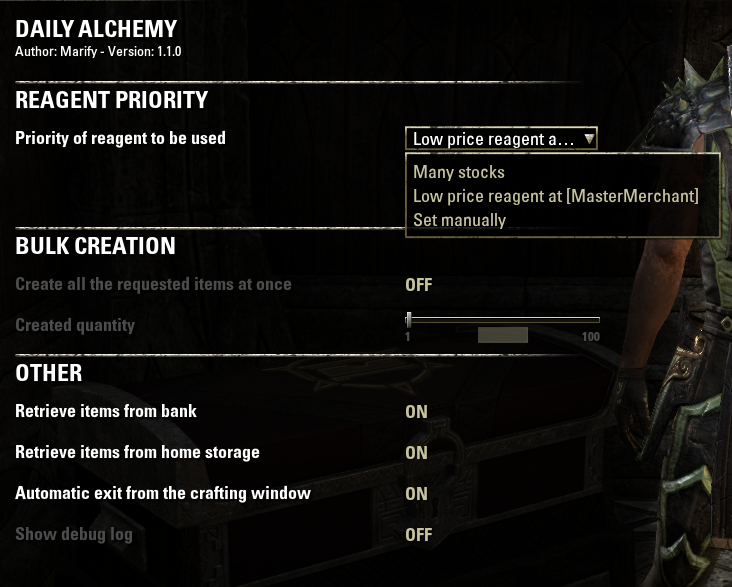 I usually craft 10 items so I only have to check Alchemy every 10th-11th day. The purpose of bulk creation, Practice for Alchemy Skills UP? Is the function you are looking for below? I will modify this add-on and consider creating a plugin for PotionMaker. 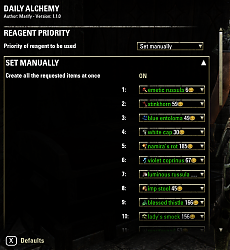 Daily Alchemy is great, but could you do Daily Provisioning too? Great addon, I really miss this feature in Dolgubon's Lazy Writ. Do you think you can make a similar addon for provisioning? 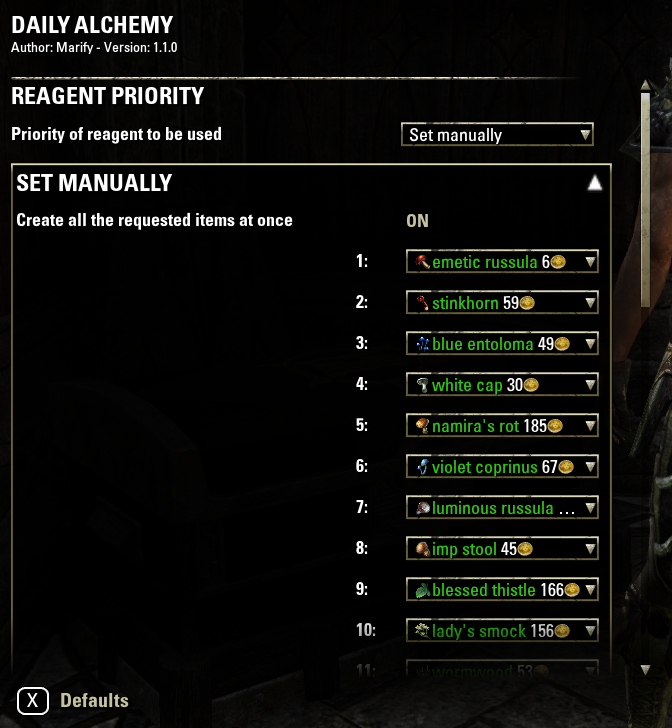 Re: Daily Alchemy is great, but could you do Daily Provisioning too? Actually, it has already been created. However, it does not correspond to the master request. Something like that. At the moment I'm using potion maker then select the quest related potion for daily writ then with the Multicraft add-on I setup 10 potions for example so it will aitocraft 10 potions. But it does not select the writ potion automatically nor setup 10. I've encountered a problem with this addon. A get a writ for a "Sip of Ravage Stamina" . Instead of making said sip, I automatically produce Tinctures of each different type, such that I have to hit alt multiple times to break out of the loop. This has happened on two different characters, both of which have solvent proficiency of one. Em... 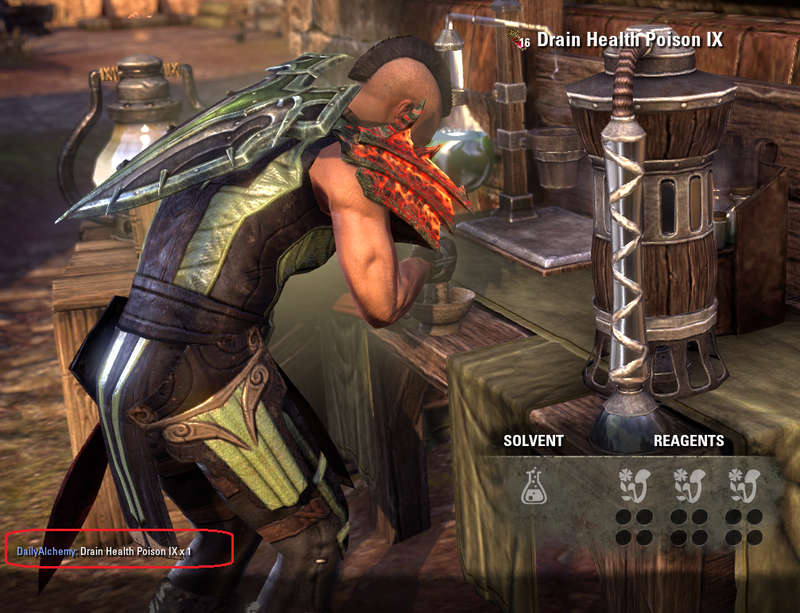 I don't know if I'm doing something wrong, but nothing happens when I get the writ and go to alchemy table. 1. I upgraded the new version 0.9.2 that fixed the bug, so please try it. 2. Do you have all the materials necessary for craft? 3. Materials with unknown characteristics are not used. 4. If not, there is a possibility of a bug. Sorry to trouble you, but please tell me the item name. If you are a master request, please tell me the quest text. Now, this function is being created. Looking forward to see it. Can it be added for the Daily Provisioning aswell? Today's daily was ravage stamina, and yes, I do have all materials and were already used. I'll see again tomorrow and report.